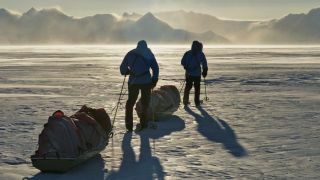 Two British explorers who recently completed Robert Falcon Scott's ill-fated 1,795-mile Terra Nova route for the first time have spoken about how technology made the Polar expedition "psychologically harder" because it lent them an escape route. Ben Saunders and Tarka L'Herpiniere traversed testing Antartic conditions on foot for 105 days, covering the equivalent of 69 marathons and losing a combined 45 kilograms in weight in the process. Saunders wrote daily blog posts using a Haswell-powered Sony Vaio Pro ultrabook customised by Intel to withstand conditions of -45C. Other equipment included an Iridium satellite phone for handling calls and messages and an always-on GPS tracker that transmitted hourly coordinates back to a UK-based support team. Speaking at a homecoming event, L'Herpiniere said: "Technology made the trip harder in some psychological respect as we had the capability to call it a day at any time. We had a phone so if we said enough was enough we could have been sent a plane to go home. "Even 20 years ago Robert Swan had to commit to finishing his expedition to Antarctica. For us, voluntarily choosing to suffer said a lot of our general state of mind." Saunders added: "I would describe the death Falcoln Scott faced as courageous. If we had died it would have been stupid - there was no need to push ourselves that far." Speaking to TRPro, Saunders said that the duo laid folded solar panels over the top of their tent at night to charge three lithium-polymer battery packs used to power up their electronic devices. He said: "Power was never really an issue. At times the weather was cloudy and it was cold so we had to be quite disciplined about how we budgeted, but it never restricted us. In fact, hardly a single bit of equipment got worn out or needed repairing." Saunders added that the decision to post online updates detailing the duo's journey gave him an "affinity" with fellow British explorer Robert Falcon Scott who, along with his team of explorers, died attempting the same expedition 100 years earlier. He said: "It was hard work and a commitment, but it was a real joy to know that so many people were following, asking questions and finding inspiration from what we were doing."